The brightest and the best! Guaranteed performance in laser and inkjet printers. Create attention-getting notices, flyers, announcements and bulletins. Acid-free for archival quality. Sheet Size (W x H): N\A; Paper Color(s): N\A; Paper Weight : N\A. 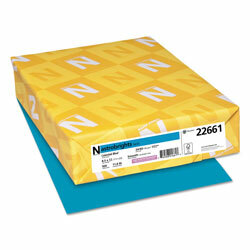 Letter Size Blue Color Paper from Wausau Papers! 1023 In Stock today.